What is Defect Life Cycle or Bug Life Cycle in software testing? Defect Life Cycle or Bug Life Cycle is a cycle which a defect goes through during its lifetime. It starts when defect is found by testing team and ends when a defect is closed. New: It is the first status of the defect. When the defect is identified and logged in bug/defect tracking tool for the first time, its status will be "New". Open / Closed: After a tester has posted a defect, the testing team lead validates the defect. If defect is valid then he changes the status as "Open". If the defect is invalid then the lead changes the status to be "Closed". Assigned: After changing the status as "Open", the testing team lead assigns the defect to corresponding developer team lead and the defect status is changed to be "Assigned". Rejected: If the developer feels that the defect is invalid and cannot be fixed then developer rejects the defect. Developer changes the status to be "Rejected". Duplicate: If the logged defect is rectified as duplicate of any other defect then the defect status changes to "Duplicate". Deferred: If the development team decides to fix the defect in upcoming release due to lack of time or the priority of the defect is low then he changes the state to "Deferred", which is later changes to "Assigned" when the defect is taken in consideration to be fixed for that release. Fixed: Once the developer fixes the bug, developer assigns the bug to the testing team for next round of testing and changes the status of bug to "Fixed". It specifies that the bug has been fixed and is "Ready for Re-test" to testing team. Ready for Re-test: Once the defect is fixed and the status is changed to "Ready for Re-test", the tester tests the defect. If the defect is not reproducible in the application, he put the appropriate comments in the bug/defect tracker tool. Re-Opened: Once the defect is fixed and status is "Ready for Re-test", the tester tests the defect. 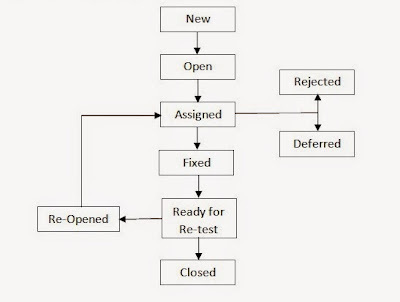 If defect is reproducible in the application, tester changes the status to "Re-Opened". Closed: After the defect status is changes to "Rejected" or "Duplicate" or testing team not able to reproduce the defect in "Ready for Re-test" status, the testing team lead verifies the comments added by development team or testing team. When he is ensured with the comments he changes the status to "Closed". 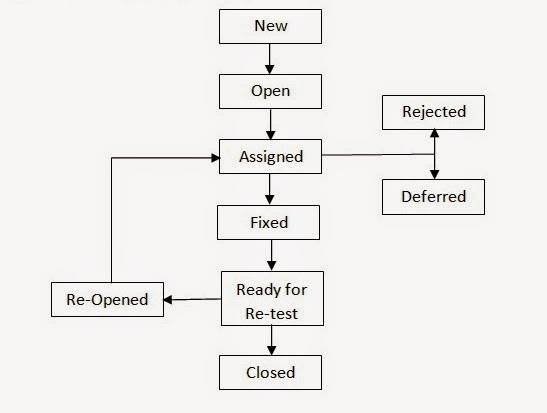 After all open defects gets closed, tester needs to perform regression testing either on project level or release level on the application to ensure whether the fixed defect is impacting other functionality of the application or not. Note: Above mentioned Defect Life Cycle or Bug Life Cycle is generic to software testing industry. Some project might have more defect status such as Withdrawn, UAT migrated in. Labels: Bug Life Cycle, Defect Life Cycle, Defect Life Cycle or Bug Life cycle, Defect/Bug Life Cycle, stage in a defect life cycle, What is a Defect Life Cycle or a Bug life cycle in software testing?